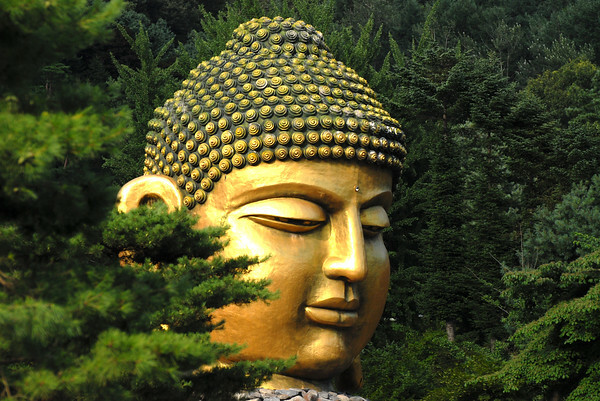 Sunday Photo; Buddha head at Waujeongsa – Wake Up and Laugh! I first saw this head in a book that features dishes from different temples across the country accompanied by a photograph taken at each temple. I wrote down the name of the temple with the gigantic head and looked it up online when i got home. It turns out it wasn’t very far from my home, so I soon my a trip with my friends to visit. When we got there, things had obviously changed. In the photo, the head sat humbly on the ground, the natural, raw material remained. As we stepped off the bus, we could see the head shinning in the noon light all the way from the road, painted gold, propped up on huge shoulders of piled stone. First impressions were a cross between impressive and ridiculous, and we all let out a good laugh at the sight of it. I don’t know the dimensions, but the temple claims that it’s the biggest Buddha head (without a body) in the world. (If you’ve followed the Sunday Photos for a while now, you’ve probably caught on that this “biggest in the world” claim is a recurring theme in Korean temples.) All I know is, it sure is the biggest head I’ve come across in my travels! I took this picture during my last visit, in the summer. I liked this angle because it reminds me a little of the first photo I saw of it, sitting humbly among the pines. Maybe this is Huineng’s missing head!